This Pelican L4 pen flashlight is a streamlined LED precision light made of rugged Xenoy Polymer Resin. It has a brilliant 5-lumen stream of light with an extremely long 32-hour battery burn time. It is small, compact with a push button tail switch. 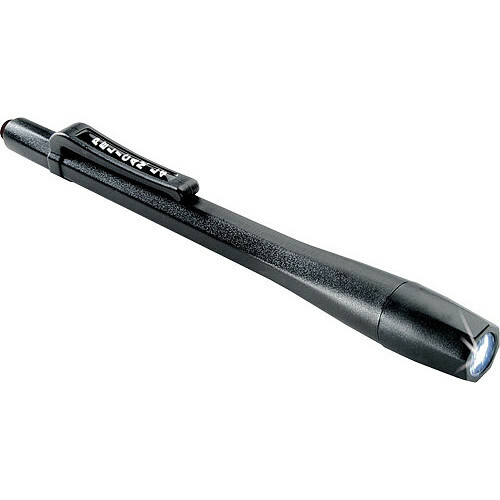 Box Dimensions (LxWxH) 8.7 x 4.5 x 0.4"
L4 3 'AAAA' Pen LED Flashlight (Black) is rated 4.4 out of 5 by 7. Rated 2 out of 5 by Jim from I has not bright as it's color I have some extra Pelican lights in different models. I love them because of their bright lights, strong and well designs. But L4 3 Pen LED Flashlight broke my expectations. It uses AAAA battery not the AAA battery. AAAA battery not easy to find as AAA This model is not give bright light as I expected. It has bluish led light and not totally white. Light is not well focus so beam diffuses after 1-2 yards and became useless. On/Off switch at the back end is hard to press and button level is very low. You have to push with your nails and finger tips forcefully to turn it on. Ladies will not love it... It could be better with longer on/off switch. I think it may use in 1-2 yards jobs as checking circuits or computer inside but not for show your way at night or in home at total darkness. Rated 5 out of 5 by Anonymous from Great I bought one of the pen flashlights before and took it with me for an Annapurna trek in Nepal, where it become invaluable part of my gear. In Nepal there is no electricity so I kept this pen flashlight in my sleeve overnight, just in case I needed it. Gave me sense of security, and when I needed it served with flying colors. The second flashlight I bought for my mom, just in case she needs it. Mine is a permanent feature in my purse. Rated 5 out of 5 by Fatdad from Looks like a pen, works like a charm! As a computer technician, I use this pen size flashlight every day at work. I used to carry a flashlight attached to my belt, but along with a multi-tool kit and cell phone also attached, it could get a little cumbersome - especially when crawling around on the floor tracing a wire.It also works well in a dark restaurant when you can't see the menu! Rated 5 out of 5 by Anonymous from Does the job.. This little light is powerful and small enough to fit neatly into my camera bag without being noticed. Perfect for fumbling around after dark - those controls can be hard to see! Rated 5 out of 5 by Christy the kid! from Another great product from pelican! Really fits in your shirt pocket well! This little light really comes in handy for all your little lighting jobs!